Unusual Silver ID Bracelet : LOVE2HAVE in the UK! 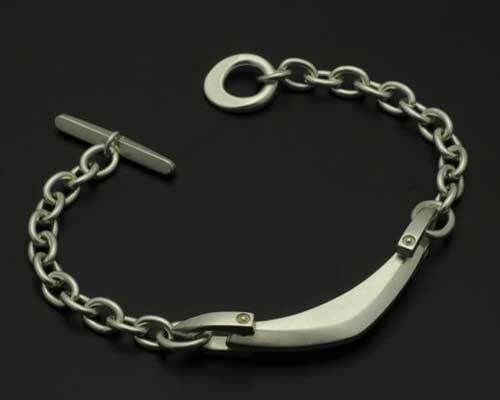 This men's or women's silver bracelet is one of the most unusual ID bracelets we have ever come across. Made from sterling silver, the central bar measures 9mm thick, 4.5mm wide and 40mm long. It has a lovely curved shaping with rounded styling with the broadest point measuring 11mm. The finish comes in a velvety matt. Attached to either side of this are silver stirrups which the silver chain comes joined. The chain is 7.5mm in width. Finally, to complement the fantastic designer styling, there is a T-Bar catch, again designed in a smoothed off styling with an offset eyelet. All in all the detail to design style is like nothing we have seen, and this bracelet would suit both men and women. When ordering, please indicate your required chain length into the comments box at check out. Approximate weight, depending on length, is 42g.